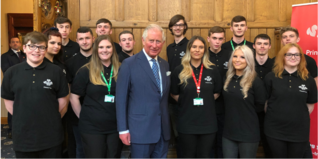 Calder Blend Barista was created by 11 students taking part in the Prince’s Trust Achieve programme which is designed to provide an experiential learning environment for young people. The Barista, the first project of its kind in South Lanarkshire, aims to introduce young people to enterprise whilst also developing their confidence, communication and customer service skills. Although Calder Blend Barista is based in the school it can become mobile for events and with the additional support of Largs Printing Company and local business Miko, the pupils have created unique branding, purchased equipment and received a City & Guilds qualification in Barista skills. Our partnership with Calderglen High to help them launch the first Prince’s Trust funded school enterprise in South Lanarkshire will be of huge benefit not only to this year’s Achieve group, but the school as a whole. The Barista will enable pupils to develop key transferrable skills that will equip them for the world of work and enterprise, whilst gaining a Prince’s Trust qualification at the same time. 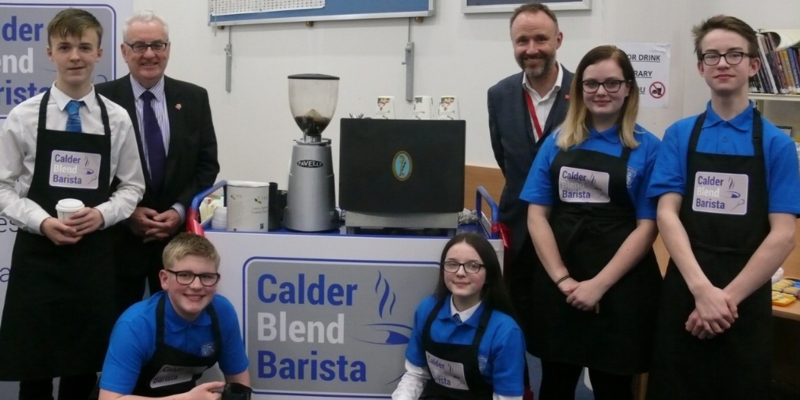 We’ve all been very impressed with the pupils’ enthusiasm and creativity from the start and the teachers drive and support in bringing Calder Blend Barista to fruition. By combining elements of the Achieve curriculum with their Barista, the pupils will be able to work towards a Level 4 or Level 5 qualification in Customer Service and Enterprise, which will gain them an Award in Personal Development and Employability (PDE). If the pupils decide to continue with the programme in the next school year, they can further supplement their experience with additional qualifications in Career Planning, Teamwork and Digital Skills. I’m delighted that our pupils and staff have taken up this opportunity so enthusiastically in order to add value to their qualifications and skills portfolio. These type of activities will enhance their employability potential and they will have regular opportunities to put their new skills into practice and develop a range of others by serving staff at the Barista each week, supporting school events and providing hospitality for guests, as well as engaging in fundraising to support various charities. The Calder Blend Barista project was funded by The Prince’s Trust, through our Cashback for Communities Development Awards.